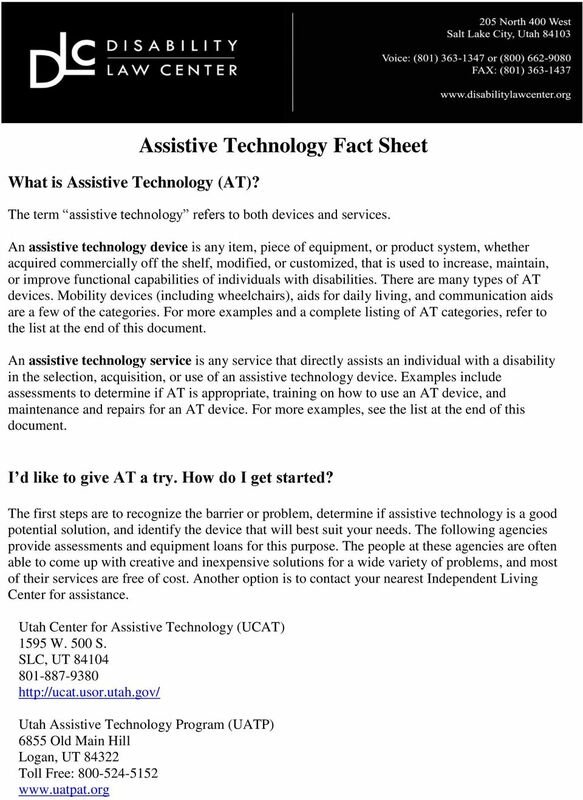 Download "Assistive Technology Fact Sheet"
4 Orientation and mobility services Vehicular modification Telecommunications Sensory devices Other technological aids and devices Special Education The regulations require that AT devices and services are made available to any student with a disability if required. A student s need for AT must be determined on a case-by-case basis. The basic standard to be met is whether or not the student needs the AT to benefit from their special education services. 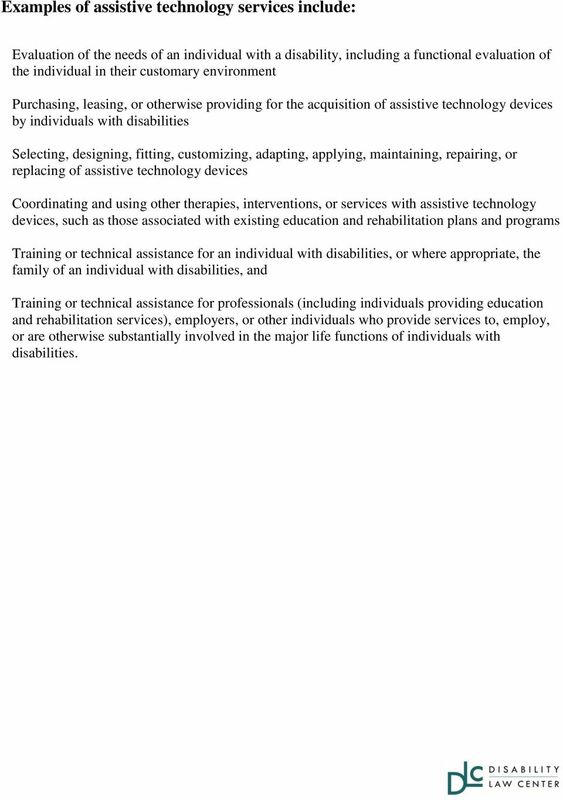 Section 504 states that, No otherwise qualified individual with a disability in the United States shall, solely by reason of her or his disability, be excluded from the participation in, be denied the benefits of, or be subjected to discrimination under any program or activity receiving federal financial assistance or under any program or activity conducted by the U.S. government. This means that students may be eligible to receive AT even if they do not need any special education services. A student would be eligible if the only services received were modifications in the regular education program. What if the requested AT device or service has been denied? 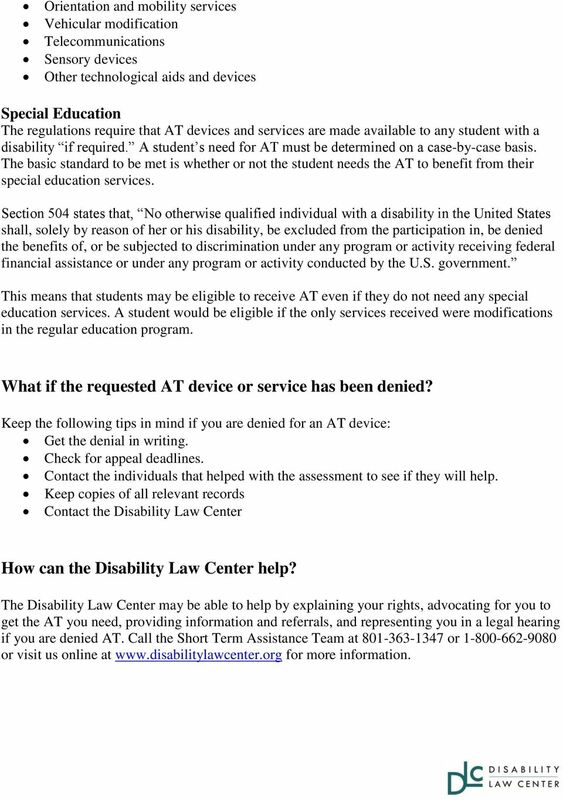 Keep the following tips in mind if you are denied for an AT device: Get the denial in writing. Check for appeal deadlines. Contact the individuals that helped with the assessment to see if they will help. 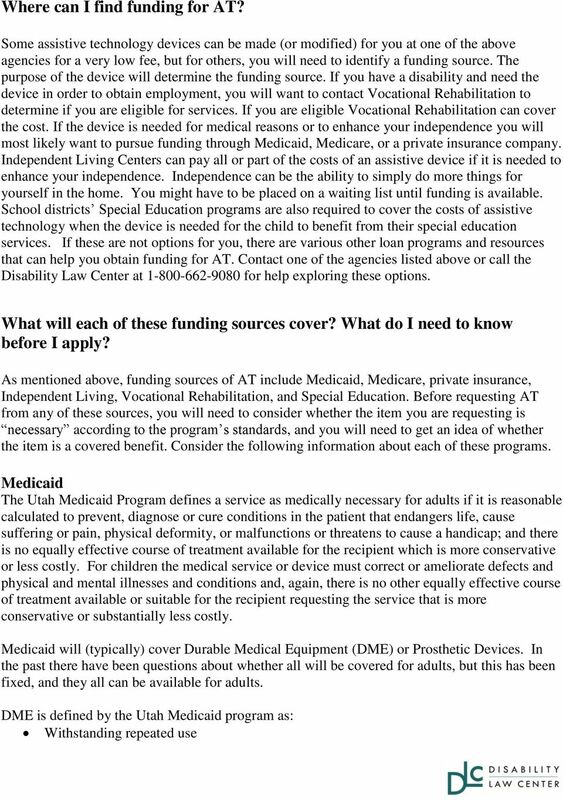 Keep copies of all relevant records Contact the Disability Law Center How can the Disability Law Center help? The Disability Law Center may be able to help by explaining your rights, advocating for you to get the AT you need, providing information and referrals, and representing you in a legal hearing if you are denied AT. Call the Short Term Assistance Team at or or visit us online at for more information. 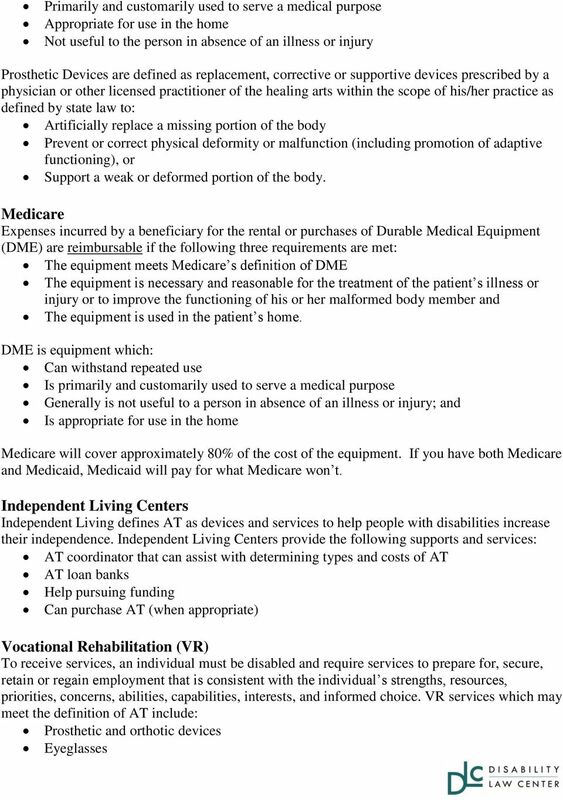 5 An assistive technology device can fall into any of the categories listed below: Aids for daily living (self-help aids) are used in activities such as eating, bathing, cooking, dressing, toileting, and home maintenance. Ambulation aids help people walk upright, such as canes, walkers and crutches. Architectural items are structural adaptations to the home or worksite that remove or reduce physical barriers. These adaptations include ramps, elevators, lowered computer stands, levers (instead of door knobs) and lowered countertops. Bed aids make bedroom functioning easier, including manual and electric beds, side rails and transfer equipment. Communication aids are for people with communication impairments. They include augmentative communication devices and manual and electronic communication boards. Educational aids enable people with disabilities to carry out school or work related activities. Computers, adaptive software and modified computer input devices are examples of these aids. Environmental controls are primarily electronic switches or systems that enable people without mobility to control appliances, electronic aids, lights, telephones, and security systems, in a room, home or other surroundings. Mobility aids allow freer movements, including transfer aids and patient lifts as well as all types of wheelchairs and three wheeled vehicles. Prosthetics and orthotics These devices which include braces and artificial limbs replace or augment missing or non-functioning body parts. Recreational aids These devices include adaptations to sports or other equipment that enable people with functional limitations to participate in recreational activities. Seating and positional aids These are modifications to wheelchairs, scooters or other seating systems that provide the body stability, upright posture or the reduction of pressure on the skin surface. The equipment includes wheelchair cushions, modular seating and seat lifts. Sensory aids These devices are for people with visual or hearing disabilities. Devices include hearing aids, FM Loop Systems, low-vision aids, reading devices and telecommunication devices for the deaf. Transportation aids These devices enable independence in personal transportation, such as car-top carriers for cars and vans, child restraint seats and modifications to ensure vehicle access. 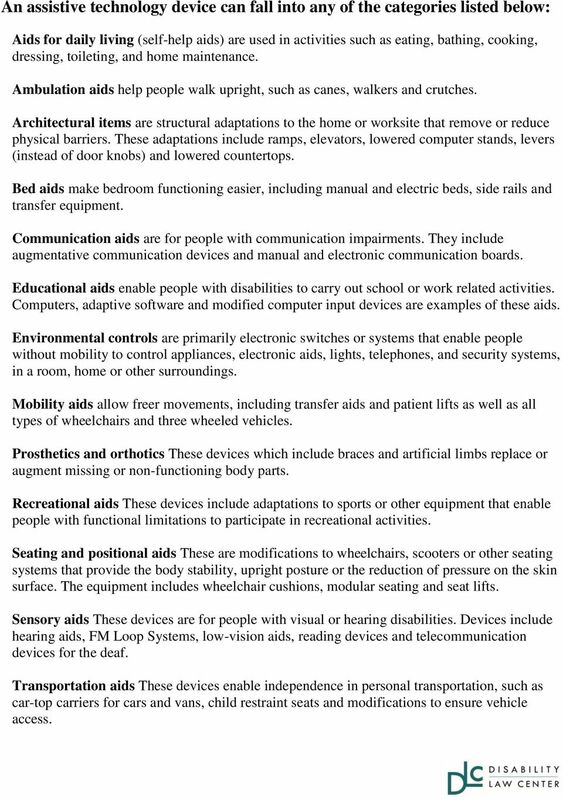 6 Examples of assistive technology services include: Evaluation of the needs of an individual with a disability, including a functional evaluation of the individual in their customary environment Purchasing, leasing, or otherwise providing for the acquisition of assistive technology devices by individuals with disabilities Selecting, designing, fitting, customizing, adapting, applying, maintaining, repairing, or replacing of assistive technology devices Coordinating and using other therapies, interventions, or services with assistive technology devices, such as those associated with existing education and rehabilitation plans and programs Training or technical assistance for an individual with disabilities, or where appropriate, the family of an individual with disabilities, and Training or technical assistance for professionals (including individuals providing education and rehabilitation services), employers, or other individuals who provide services to, employ, or are otherwise substantially involved in the major life functions of individuals with disabilities. MRC VEHICLE MODIFICATION PROGRAM FREQUENTLY ASKED QUESTIONS (FAQ S) 1. What kind of services does the MRC Vehicle Modification Program provide? Financial Tips for Parents of Children with Special Needs Children and youth with special needs have medical, emotional, developmental, mental or behavioural problems that require ongoing help and support. Alberta Government Health Insurance Plan offers Limited Coverage.